Charles ROBINSON (father), Wilson Street, Geraldine. Later of Maungati via Timaru, then of Otipua via Timaru. Height 5 feet 6 inches. Weight 140 lbs. Chest measurement 32½-35 inches. Complexion fair. Eyes brown. Hair dark brown. Sight and hearing both good. Colour vision corect. Limbs well formed. Full and perfect movement of all joints. Chest well formed. Heart and lungs normal. Teeth good. Free from hernia, varicocele, varicose veins, haemorrhoids, inveterate or contagious skin disease. Vccinated. Good bodily and mental health. No slight defects. 3 December 1915 - admissted to HS Gloucester Castle, Dardanelles - neuritis; 8 December 1915 admitted to NZ General Hospital at Caro;10 January 1916 discharged from hospital at Alexandria & returned to duty. 25 September 1916 - admitted to NZ Stationary Hospital at Rouen - gunshot wound to left arm; 27 September embarked for England & admitted to Convalescent Depot at Hornchurch. 24 January 1917 - admitted to No.1 Australian Casualty Clearing Station (VD), then to No. 5 General Hospital. Arthur Gordon Robinson was born on 3 February 1898 at Temuka, the third son of Charles and Esther (née Fawdray) Robinson, later of Otipua, Timaru. Along with his siblings, Arthur was educated at Temuka and Geraldine schools, as the family moved between the two locations. From a very young age Arthur joined his brothers at the Temuka Primitive Methodists Sunday School. In November 1903 at the anniversary celebrations he was a prize winner in the 4th Class. Both Arthur and his brother George gave recitations at the Band of Hope gathering in connection with the Temuka Primitive Methodist Church in September 1905. In spite of the heavy rain the church was filled to capacity with adults and children for a splendid programme of solos, recitations and dialogues. On the 23rd anniversary of the Sunday School, in November 1906, young Arthur was again awarded a prize, this time in Class III. At the weekly meeting of the Geraldine Goodwill Band of Hope, held on 15 May 1908, Arthur presented “Away with Wine”. It was at the annual prize distribution to children attending the Geraldine Presbyterian Sunday School in February 1909, that Arthur collected a prize in Mrs Todd’s Class. And at the anniversary tea and after-meeting of the Geraldine Primitive Methodist Church Sunday School in March 1910, Arthur Robinson was one who gave a recitation. Two months later he gave another recitation, “The Blind Boy”, at the Goodwill Band of Hope weekly meeting. In February 1913 Arthur Robinson was one of several youths before the Court, charged with failing to render person al service. The excuses of those who appeared were considered favourably by the Magistrate. Unfortunately Arthur was one who did not appear and was “muleted” in a penalty of 20 shillings and costs. In November he was charged under the Defence Act with failing to attend camp. His case was adjourned until 16 December. In November 1914 he was one of a group of Geraldine cadets who were charged with failing to attend drill. No fine was inflicted, however, as the Defence authorities had not been able to devote much attention to the Cadets, and the cases were dismissed. His Serial Number is given as 6/2833A in Nominal Rolls, 6/2533 in CWGC, and 6/2533 & 6/2257 in Archives NZ (Archway). Arthur Gordon Robinson, 6/2257, enlisted firstly on 14 February 1915, then again on 13 June 1915 (6/2533), aged 17 years 4 months, although he put his age up by two years. As at February, Arthur had been serving for six months with the 2nd South Canterbury Infantry, and was still serving, but on 28 April 1915 he had been discharged from the 5th Reinforcements as he was under age. Arthur gave his address as care of Charles Robinson, Wilson Street, Geraldine, and was working as a farmer on Winchester Road, Geraldine, then as a ploughman at Woodbury. Single, of Wesleyan adherence, and in good physical and mental health, he named his father as his next-of-kin. A visit home in July 1915 for several Geraldine men who had been undergoing training at Trentham provided an opportunity for some two hundred young people to gather in the Volunteer Hall to entertain the men and do them honour. The evening passed quickly with music, songs, games and dancing. During an interval, good wishes were conveyed to the soldiers, who included A. Robinson. Appreciation of their actions was expressed and admiration for their courage in going to do their duty to their country. Arthur was only 17 years old when he embarked for the front at Wellington on 14 August 1915, destined for Suez, Egypt. Arthur joined the Sixth Reinforcements, Canterbury Infantry Battalion. On 30 September at Mudros he joined his battalion. Just nine weeks later he was admitted to the Hospital Ship Gloucester Castle at the Dardanelles, suffering from neuritis, and a few days later admitted to the New Zealand General Hospital at Cairo. On 10 January 1916 Private Arthur Gordon Robinson, 6/2833a, Canterbury Battalion, was discharged convalescent from hospital at Alexandria to duty, rejoining his battalion at Ismailia on 18 January. In early April he embarked at Port Said for France per the “Franconia”. Having suffered a gunshot wound to his left arm on 25 September 1916, he was admitted to the New Zealand Stationary Hospital at Rouen before embarking on 27 September for England, where he was admitted to Brockenhurst before being transferred to the Convalescent Depot at Hornchurch. In October he was instructed to report to Codford, and in December he proceeded overseas to France. On 24 January 1917 he was admitted to the 1st Australian Casualty Clearing Station (VD), then to No. 5 General Hospital for two months before he was discharged on 29 March 1917. It was not until 3 June 1917 that he returned to action in France, rejoining his battalion on 7 June. Private Arthur Gordon Robinson, 6/2533, was just 19 years old when he was killed in action on 7 June 1917 in the Battle of Messines, the news being reported in Casualty List No. 601. Mr Robinson received telegrams from the Governor (Lord Liverpool) and through him from the King, expressing their sympathy in his loss. The Minister of Defence also telegraphed his condolences. Shortly after Mr and Mrs Charles Robinson thanked their friends for the kind expressions and tokens of sympathy extended to them. Arthur’s age was officially recorded as 20 or 21 years on account of the earlier incorrect information. T seems that he was first buried in the Rosenburgh Chateau Military Cemetery, and then reinterred in the Berks Cemetery Extension, Comines-Warneton, Hainaut, Belgium. There 82 New Zealand casualties were laid to rest. Situated in the village of Ploegsteert in the Ypres Salient on the Western Front, the cemetery was gifted to the United Kingdom in perpetuity by King Albert I of Belgium in recognition of the sacrifices made by the British Empire in the defence and liberation of Belgium during the war. Arthur Robinson was a member of the Geraldine Football Club. The report presented at the annual meeting in April 1917 stated that owing to war conditions the club had not been very active during the past season. The club was very proud of the number of members it had provided for active service, there being 28 at the time at the front. These members were unanimously retained on the roll during the term of the war. Sadly, the prospect of returning to football ended all too soon for Arthur. A letter from Corporal D. D. Turner received by his father James at Geraldine in July 1917, made mention of Arthur Robinson. Arthur had joined Corporal David Turner’s section on 6 June, the day before “one of Fritz’s 5.9’s” came over and “spoilt the whole show”. D. D. Turner was struck by shell and went to hospital at Boulogne. At that point he did not know how A. Robinson, who “was in the mob”, had fared. Since then news had reached Geraldine that Private A. Robinson had died. His medals - 1914-15 Star, British War Medal and Victory Medal – were awarded for his service in all three theatres of war. The 1914-15 Star was sent to Esther Robinson at Maungati via Timaru in 1920, after his mother advised a change of address. 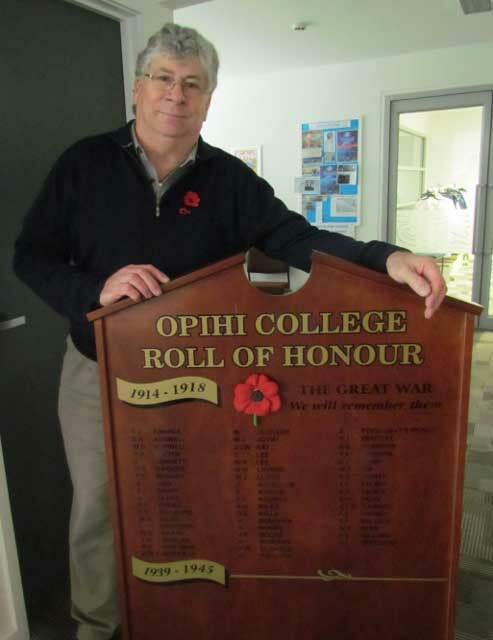 The scroll and plaque were later sent to his father at Otipua via Timaru. The “Temuka Leader” recorded his name regularly in the Geraldine List of its Roll of Honour. His name is inscribed on the Timaru Memorial Wall, the Geraldine War Memorial, St Mary's Anglican Church Geraldine Memorial and the Geraldine War Memorial. George Lyndon Robinson, a younger brother of Arthur, also put his age up on enlisting. George died in 1926 at the Timaru Hospital, aged just 27 years old. Another brother, Leonard Charles Robinson, was listed on the Reserve Rolls for World War I. In his April 1918 report to the annual meeting, the Rev. Canon Staples Hamilton, vicar of St Mary’s Anglican Church, Geraldine, added ten names to the list of men from the parish who had given their lives for their country, among those names being that of A. G. Robinson. At the Geraldine Parish Church (St Mary’s) in late June 1924, a beautiful stained glass window and brass tablet, erected in memory of men of the parish and church who gave their lives for their country in the Great War, were unveiled by Archbishop Julius. Perhaps some relatives of A. G. Robinson were in the congregation. After the dedication of the memorial, “The Last Post” was sounded and the National Anthem sung. The window features Christ as the King of Glory above a soldier dedicating his sword to God. The ceremony was “very earnest and impressive”, and the psalm and hymns of a comforting nature. The inscription on the brass tablet reads “To the Glory of God and in grateful remembrance of these our fellow churchmen of the Geraldine parish who gave their lives for their country in the Great War, 1914-1918, this window is dedicated." The names follow, including that of A. G. Robinson. The name of A. Robinson was heard again in October 1932 when the Diamond Jubilee of Geraldine School was celebrated. Prior to the concluding service, ex-pupils assembled at the Great War Memorial, where a wreath was deposited in honour of the ex-scholars who had made the supreme sacrifice in the Empire's hour of need. The secretary of the Geraldine Returned Soldiers' Association (Mr A. R. Hawke, a returned soldier) handed a beautiful wreath, inscribed “In Memory of Old Schoolmates — Lest We Forget,” to the Rev. Canon Coursey, who placed it at the foot of the Memorial, the ex-pupils standing in silence. “I dedicate this wreath,” said Canon Coursey, “to the . 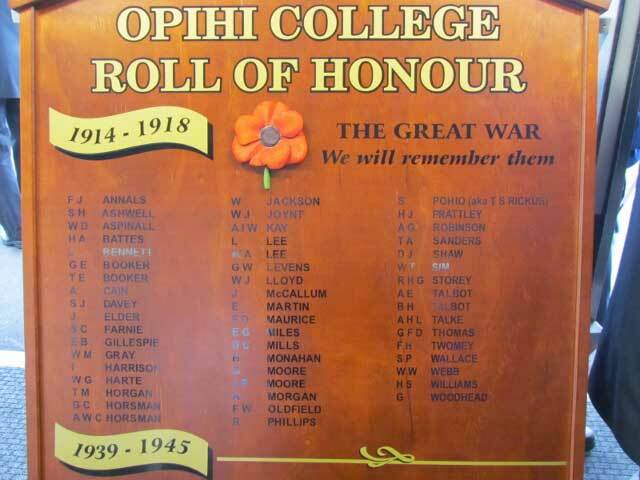 . . ex-pupils who laid down their lives during the Great War: — . . . ., A. Robinson, [and others]. Let those who follow see that their names are not forgotten.” (Temuka Leader, 18 October 1932).